When Muffin walks up to greet a visitor to his home, he looks like an angel. It’s not just his toy poodle cuteness, nor the harness with the white wings. It’s the halo that bumps gently against the visitor’s legs letting Muffin, who has been blind for the past two years not to keep moving forward. The halo is the creation of Muffin’s owner Silvie Bordeaux. Silvie and Muffin have been together since Muffin was eight weeks old. When Muffin started developing cataracts in 2011, it was heart-breaking for Sylvie. When they came back, Silvie took him to the vet and to a veterinary ophthalmologist. The ophthalmologist suggested surgery for the cataracts, but Muffin has a heart murmur. The vet found a mass in Muffin’s stomach during his exam. A first aspiration biopsy (removal of tissue from the tumor using a needle) showed that the tumor was benign. During a follow-up aspiration, however, a major blood vessel was nicked. For several days it wasn’t certain that Muffin would survive. Muffin did pull through. Silvie gave up her health and fitness public relations agency to focus on her concepts for protecting dogs that were blind or losing their eyesight. She often went to a nearby Sherman Oaks park to search for volunteer dogs to try on her prototypes. The final product is remarkably simple. It consists of a fitted harness that fits around the dog’s body with Velcro, a padded pillow that attaches to the harness with Velcro over the shoulders and a light weight “halo” that goes through holes in the pillow and attaches behind with Velcro straps. 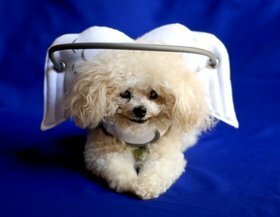 The angle of the halo can be adjusted according to the dog’s needs. As Silvie talked, Muffin wandered around the living room, changing direction as his halo touched walls or easy chairs. He made his way around the iron legs of a coffee table and finally stretched out on the floor by Silvie’s feet for a nap. The device didn’t interfere with his freedom to move about, curl up, lay down or stretch out. 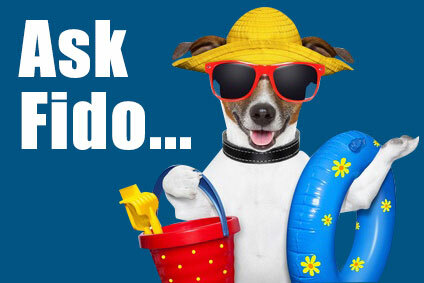 The product is available in different sizes to first dogs ranging from a two-pound Yorkie to a 100-pound Goldenoodle. It comes in various colors and styles: the angel wings in white, red and blue; a quarterback style in blue and orange; and butterfly wings in yellow, orange, blue and white. Prices run from about $85 to $105, depending on the size. Photos and video don’t really do this product justice. It is both lightweight and sturdy. It fits so closely to the dog’s body that it’s almost like a part of him. The halo isn’t floppy; it stays in place. It’s functional in keeping a blind dog from bumping into walls or furniture of people, yet allows the dog to eat and drink and be held without interference. The cotton poly twill used for the wings (or football pads) is solidly stitched together and well stuffed. When the halo is removed, the wings and harness can be machine washed using the delicate cycle or hand washed. Muffin’s Halo can be ordered online. Silvie can be reached by phone at (818) 943-9673 or by email at Muffinshalo@aol.com. Silvie has just set up a nonprofit foundation — Second Chances for Blind Dogs Foundation — to raise funds to be able to provide the halos to blind dogs in shelters, who are often first on the list to be put down. The halo is attention grabbing and takes away some of the stigma and uncertainty about approaching a blind dog, Silvie noted.